Spring flowers are starting to pop up and I'm dreaming of swimming pools and book reading in the sun. 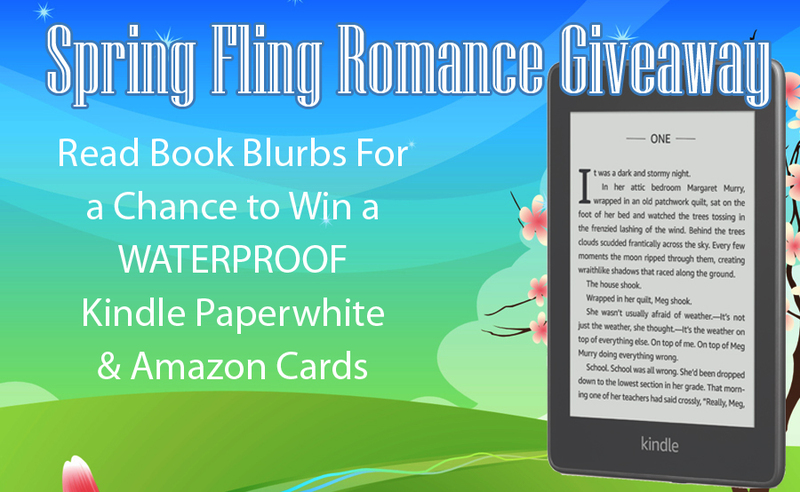 Come on over and enter to win a Kindle and Amazon Cards in our Spring Fling romance lover online scavenger hunt. How do you enter? By reading romance book blurbs, sharing the event, following us and more. Lets get started. Join us on Monday April 29th, 2019 as we announce the winners in our party chat room. The event starts at 8 pm Eastern and lasts about 30 minutes. You do not have to attend the chat to win. Amazon Cards are open to the world. The Kindle prize is open to USA only. Void where prohibited. You must be 18 or over to enter. Each entrant can only enter once and win one prize per giveaway.